As I’ve mentioned before, I’m positioned defensively and a little to the short side. Not crazy short, but skewed short nonetheless. One way to avoid problems at key junctures is to choose your positions carefully. Someone is going to be right and make a ton of money off NFLX short, but it isn’t going to be me. The key to persistent rallies is to find pairs that work for the situation. Lately, I’ve been playing long (relatively) good fundamentals and a high short interest against short (relatively) bad fundamentals with a low short interest. Structuring trades this way means that when the market goes starts rolling over you have correlated stocks moving together with the high short interest hopefully moving down slower due to happy shorts buying back their profitable trades (built in demand). So your shorts should make more than your longs lose if the market rolls over on you. If the market keeps rolling into new highs the high short interest is going to need to get covered forcing your longs to make more than your shorts lose. The case for trading this way is in the tape. We are in a persistent uptrend. I’ve positioned myself for the outcome I want (I’m net short) but I’m making sure that I don’t get killed in the process (using some creative asset allocation). I’m still trading setups that I would always take, just with an emphasis on being long the high short interest. If we were in a downtrend I’d be playing things differently. For example, in a downtrend, you don’t bet against the short interest, you assume that the large shorts have done their research and are correct. The trade I’m laying out here are for those who can trade fast and be reactive while the market to makes up its mind. I’m going to use Residential REITS for this example. This is a tough task for those without experience or an analytical tool set to draw from. Only take the ones that have high correlation at this point. We are trying to be close to market neutral on this trade. My idea of good behavior is going to be different than your idea of good behavior, just personal preference and risk tolerance. This is another tough one if you don’t have any analytical tools at your disposal. Search for some of the free correlation tools I’ve mentioned in the archives. In a toppy market high short interest will offer some support in down moves as shorts cover for profit, and more importantly it will accelerate moves to the upside due as the shorts covering their positions on upticks. Beautiful. This dynamic changes once the momentum changes, so be careful. Put all the spreads together and have a look at the charts. Look for support and resistance. Look for a chart that looks “good”. Do not swing for the fences on these trades. Some of the time, the shorts are right on a particular name and there is information that your research will not have uncovered. You will be wrong in these instances and you do not want to lose big. Below is an example of the screen I just outlined and a chart pulled from the list. 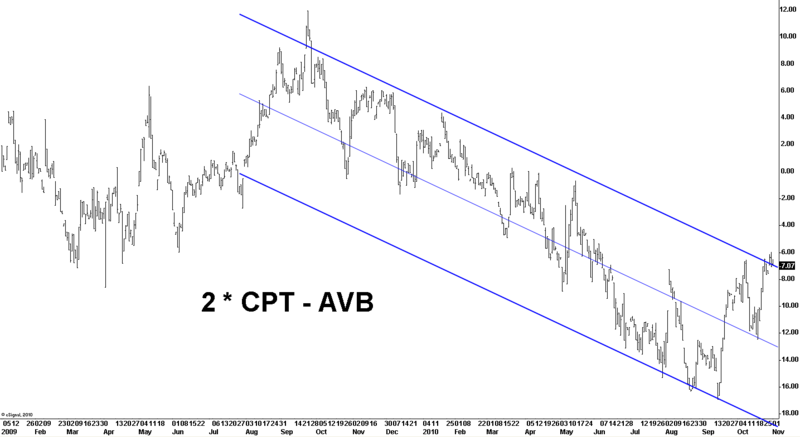 This process is missing some color and this pair (CPT – AVB) is no where near what I would call a perfect setup, it wasn’t even the best in the screener list, but it works for the example. Now go out and find your own.